Open System Preferences. Click "Print & Fax". Click "+" button to open "Add Printer" window. 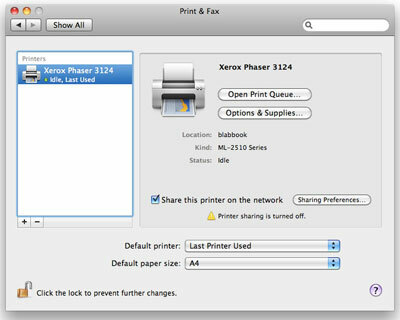 If the printer has connected, "Xerox Phaser 3124" will be on the list. 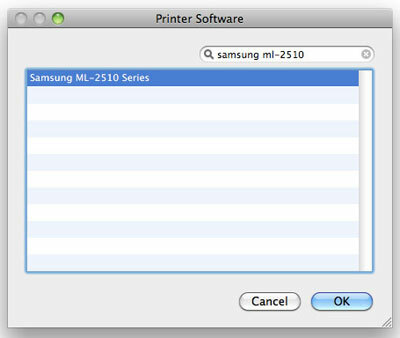 On "Print Using" choose "Select Printer Software...". On the new window, will be listed some available driver options, choose "Samsung ML-2510 series", click "OK". Then click "Add" button. If you do not face any issues, "Xerox Phaser 3124" is listed in the left column. Print a document to try the printer and confirm it works well. 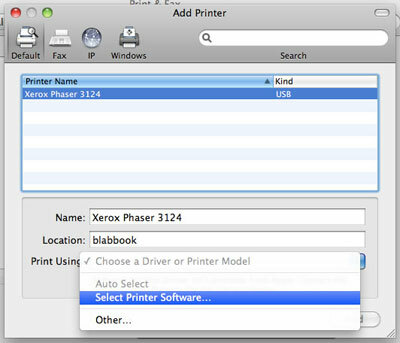 PS: I originally posted this article in Bahasa Indonesia at MakeMac : Printer Xerox Phaser 3124 dan Mac OS X. 12066 views. This post is copyrighted — materials from other creator are explicitly mentioned. You may use any information for non-commercial purpose with credits and backlinks. For commercial purpose, please let me know first. You saved my day. I had a client in Australia who I helped set up all his Macs just to find out we couldn't print anymore. I looked through everything, tried other Xerox printer drivers (for other modules), and couldn't find anything. Finally found your how to, and it works beautiful. I used the Samsung ML-2510 driver as you directed on two iMacs running the latest macOS Siera and it works great. Thanks! Glad to hear that, Philip!